By studying the bidding and play of the world's best players you can improve your own game. "Learn from the Stars" by Mark Horton and Tony Sowter is a collection of deals, divided into bidding, declarer play and defence, where the reader can compare how experts have handled the different aspects of the game. Although there are a few difficult squeezes and endplays included, there is also much that the average club player can apply to his or her own game. "Bridge: The Vital Principles" by Freddie North contains 69 deals; each one presented as a problem on the right hand page with the solution overleaf. Almost every type of play is covered, with the deals becoming gradually more difficult. The book is aimed at the intermediate player but many more experienced players can only benefit from the latter quizzes. East opens 1♠; South doubles and ends up in 3♥. West leads the ♠2, but East does not put up his ♠K no matter which card you play from dummy. How should South continue? As well as giving a neat solution, the author states the principle involved. Here you have been presented with a Greek gift. Unless you win trick one with the ♠A, you will lose five tricks. You should win with the ♠A, draw trumps, and then play a ♠ todummy's ♠10. Dummy cannot be denied an entry so you can lead a ♣ towards your ♣K and make the contract whenever East holds the ♣A and trumps are 3-2. Readers will quickly discover the gaps in their knowledge, and for this reason the book is a must for your bridge library. A very enjoyable read. "The Complete Book on Overcalls in Contract Bridge" by Mike Lawrence is exactly what its title suggests. Chapters are 1-level overcalls, overcalling on 4-card suits, taking vulnerability into account, 2-level overcalls, when both opponents have bid, responding to an overcall, introducing a new suit, raising partner's overcall, the Responsive Double, the many faces of the cue bid, overcaller's rebids, when game is not possible. This is a must-have book for players of all levels. The 2009 revised edition of this book (left) is recommended. "Judgment at Bridge" by Mike Lawrence is a book about style, rather than system. Should you open 1♣ or 1♦ when you have 3 of each, and when you have 4 of each? Should you open 1NT with a 5-card major, or with a 6-card minor? Should you raise your partner's 1♥ opening with 3-card support or bid your 4-card ♠ suit? The book is crammed full of examples of everyday decisions both in bidding and play, to help you improve your own judgment when your hand appears to meets the established criteria for more than one action. Chapters cover: What went wrong? Avoid the common errors. The short club, take out double, signoffs, over/underbidding, suit preference etc. Julian Pottage worked on a number of books with the late Terence Reese, and this one pays homage to a man who was certainly the best bridge writer of his time. One of Reese's classics, Play These Hands With Me , pioneered the 'over-the-shoulder' style of bridge writing. What that book did for declarer play, "Defend These Hands With Me" by Julian Pottage will do for defense: the reader can follow the thinking of an expert player, stopping at critical points in the play to make his own decision about how to continue. Julian Pottage 's previous books include "Clues From the Bidding" (reviewed below) and a number of titles co-authored with the late Terence Reese. He lives near London, England, and is a regular contributor to BRIDGE magazine in the UK. Defenders invariably base their strategy on declarer's bidding. Yet so often declarers fail to do the same: they often thrash away without a thought of what the defenders have or have not done. Just one bid from an opponent may tip off declarer to the winning play - perhaps warning of a bad break or that a finesse is doomed. When the defenders have made several bids the declarer may be able to make spectacular double-dummy plays. The problems in "Clues from the Bidding", by Julian pottage, all contains situations where an astute declarer can listen to the bidding, or lack of it, and derive information critical to the success of his contract. This book was originally published in 1990, and this new edition is substantially revised and expanded. In "Bridge, Zia... and Me" One of the world's top bridge players chronicles his career from his early days growing up in the UK to his position today as one of the world's best. Michael Rosenberg and the flamboyant Zia Mahmood, who also now lives in the US, were one of the world's best partnerships. Here we learn how they first met and started playing together. There are fascinating and funny anecdotes from Rosenberg's own career, his all-time favorite hands, and tips and ideas that will help the reader improve his own game. Finally, the author discusses some of the thorny ethical issues that plague today's tournament scene, and offers his own ideas on how to solve them. "Play or Defend" by Julian Pottage is an unusual problem book in the style of Diosy's "There Must Be a Way ", in that the reader is shown all four hands and asked whether declarer or defense should prevail with best play. A fascinating challenge for the advancing player. In this quiz book "Bridge Problems for a New Millennium", Julian Pottage has compiled a set of challenges that will test the reader's ability both as declarer and on defense. The hands are organized by theme, so readers are able to concentrate on a particular aspect of card-play if they wish. "First Principles of Card Play" by the Australian international Paul Marston is designed to help bridge players already familiar with bidding to hone their skills as declarers and defenders. "The Principles of Card Play: Contract Bridge" by Paul Marston is the follow up book once you have mastered the first principles. "The Language Of Bidding " by Paul Marston is the bidding companion of the very popular "Principles of Card Play" for the intermediate to average player. The book also includes a few points on card play. Or buy from Amazon.co.uk . "Winning Decisions in Competitive Bidding " by Paul Marston sets out an easy-to-follow strategy that will have you competing to the right level. Suitable for all players, by using the tips in this book you will see a quick improvement in your results. Or buy from Amazon.co.uk . “Inside the Bermuda Bowl” by John Swanson is an expert's fascinating account of bridge at the very top, containing great interesting bridge hands and great stories. Many of the hands are presented as problems so that the reader can compare his or her judgment against the best in the world. There are personal glimpses of some of the greatest players of all time and details of some of the biggest cheating scandals the game has ever seen. "Becoming a Bridge Expert: Sure-Fire Tips and Secrets to Boost Your Scores" is a compendium of advice for the improving player from Frank Stewart, one of North America's best-known bridge teachers and writers. Each tip is bite-sized - 3-4 pages in length - so the reader can dip in briefly and still take away an important idea. As well as the usual sections on bidding, play and defense, the author includes much advice on the psychological aspects of the game, including how to be a good partner. The Bermuda Bowl is the bridge championship - the one everyone wants to win: the World Open Teams title. 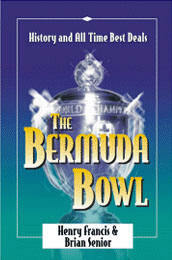 "The Bermuda Bowl: History and All the Best Deals" Henry Francis and Brian Senior go right back to the beginning in1950 up to the late nineties, in a year by year account of this great tournament. A definitive account of the greatest bridge championships in the world, illustrated with lots of photos. "The Tao of Bridge" by Brent Manley gives 200 principles to improve all aspects of your bridge and transform your game. Whatever bidding system you use, "Modernizing Your Bridge Bidding" by Gerald Olsen will help you to upgrade it. Whether you just need a convention top-up or a full overhaul, this is the book for you. "Play Cards with Tim Seres" by Michael Courtney is a collection of interesting and difficult hands from one of Australia's greatest players. Only for the more advanced player. "A Great Deal of Bridge Problems" by Julian Pottage really is a great bridge problem collection. Julian Pottage has developed a well-earned reputation as a great problem constructor. His answers are sharp and to the point.